Let’s find out what all the same is Image Analysis and what is it for? Analysis of images and photos is comprised not only of determining the quality of the received photos, but also in assessment of their information capacity. In order to define how good the digital image is made, one should analyze, for example, its histogram photo. The last action can be connected with finding objects in the image and defining their characteristics such as colour, size, etc. Examination of the image quality includes assessment of the photo sharpness, colour balance, pixel by pixel analysis and so on. Often processing and analysis of images are conducted. In cases when it is necessary to select the objects or areas of interest in the photo, before making the quantitative analysis and conduct measurements, it is necessary to find borders of objects of interest in the image and fade out the extra details. Editing of images is also necessary for conducting visual analysis, for example, preliminary processing of an X-ray image significantly simplifies its examination. As analysis and processing of images are deeply connected, algorithms of image analysis are associated with methods of their processing. For example, information on the objects borders is valuable by image analysis; for increasing information capacity of the photo and its further examination it is possible to use one of the threshold, morphological and other functions for defining contours. Binarization (or transformation of half-hue image, which has many gradation of brightness, into black and white) leaves only details of images and their borders, and eliminates the background, dilatation consolidates homogenous areas, opening deletes the noises, gradient defines contours, etc. For setting colour and sharpness of digital images it is possible to use the histogram of brightness and contrast, gamma-correction operation, and many others. In order to enter digital images from video-, web-, or photocamera into the computer, and for their further investigation, one needs a system of image analysis: besides controlling the capture device, it also provides opportunities for analysis and processing of images. Altami Studio application is worked out specially for controlling the system of data input and its settings, and also for conducting examination and processing of images. 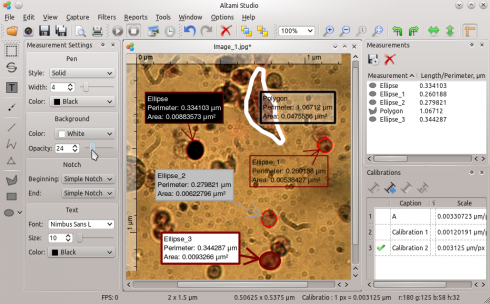 For example, in the application a very convenient instrument for pixel by pixel analysis is realized – Zoom (zooms in the selected area and defines the values of pixel brightnesses in the selected radius, and also shows its components of red, blue, and green colours and their hues). In Altami Studio application there are many filters for different transformations of images: threshold (adaptive threshold, find contours, Sobel transformation, etc), morphological (dilate, erode, opening, gradient, etc), for work with colour and form of the image (gamma, negative, smooth), correction distortion and many others. Also, for quick selecting of contours it is possible to use the operation Automatic search of objects. Upon the results, found by the use of this transformation, it is possible to use the measurements statistics, which includes characteristics of objects (area, perimeter). For measurements of objects in this application there exist such instruments as section, oval, circle, rectangle, polygon, with the help of which it is possible to select the object of interest and find its parameters (length, area, perimeter) and also to get the statistics of the conducted measurements.